Six years ago today I was blissfully sitting on a birthing ball, happily and anxiously awaiting the birth of my first child. He was born late at night on the 29th after what was really a very short 6-7 hour labor. I had planned to take the day off from sewing today and take the little monster out to the sledding hill and to McD's for lunch (get that cheese burger fix), but his father really wanted to take him skiing for the 1st time instead. So, somewhat sadly I allowed him to go. All the while, all I could really do is think how much I worked 6 years ago today, and I ought to be the one taking him off somewhere! But, it has left me with at nice 2 hour window to sew while my other monsters (oops, I mean monkeys) napped. I did start on the back ground of one of the swap quilts today. I have once again dug into my large blue stash. I'm not much of a blue user, so it feels good to rid the stash of some of this. I ordered a fair bit of fabric this week (I know, shame on ME!!) - it is from Ebay and is largely Kaffe Fasset, which I LOVE!! I also did a little shopping at Borders this morning, picking up one of the Civil War Quilt Diary books. I don't really like Civil War prints much, but I do like the book and the patterns, perhaps done with a more modern approach. One of the comments I got yesterday was that a turtle ought to have some water lillies & dragonflies. Now I'm no water lily expert, but I can handle a few dragonflies. 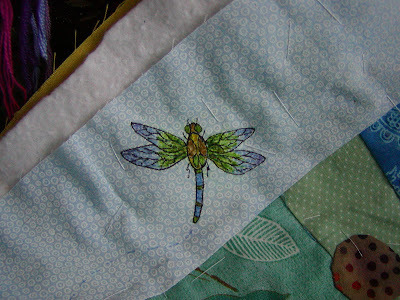 I auditioned this perfect dragonfly fabric I had, but decided it did not work in so well. So...I got creative with my permanent fine-tip sharpie pens, which by the way are worth their weight in GOLD. I have bought the $3 a piece fabric pens and they don't write a clean line w/o bleeding. These are 28 pens for $12 at Sams. 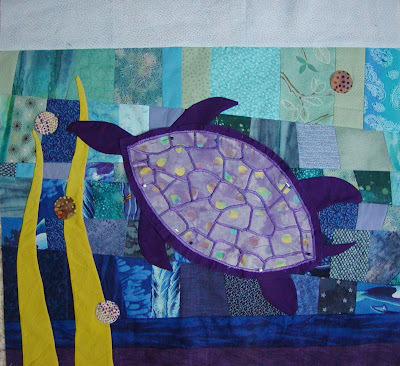 Here's the purple turtle, Lucky in his water home (not yet sewn down). 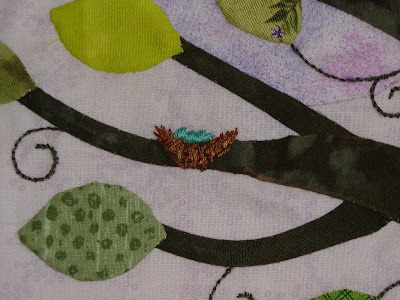 There are just a few sea-weeds and fun circular bobbles in some of my favorite batik scraps. 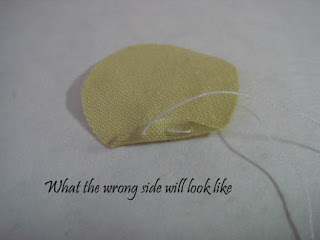 I rarely do a satin-stitch applique because it looks so amateurish and tends to buckle and not lay flat. But Lucky needed this to designate the lines on his shell. There was no way I was going to stitch all of those pieces on separately. 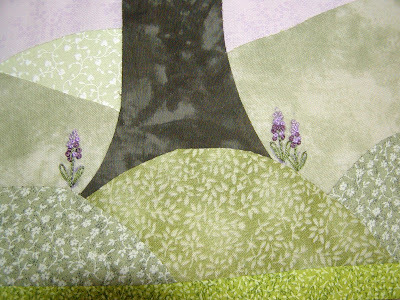 The other items on the quilt are needle-turn appliqued down. And here is one of the dragon-flies I drew. 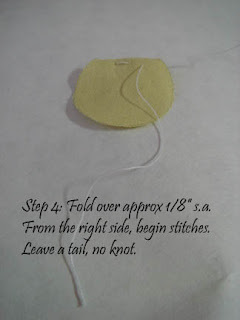 For those of you that may be interested in another swap, Toni the Quilting Pirate is contemplating starting one. Go to her blog if you are interested. Here's the sign up blog! Here's Lucky. He's a turtle and he is just dying to be made into a quilt. Actually, I began by first making some "ocean" from my many blue choices of fabric. My blue stash is enormous because I made this a couple years ago. 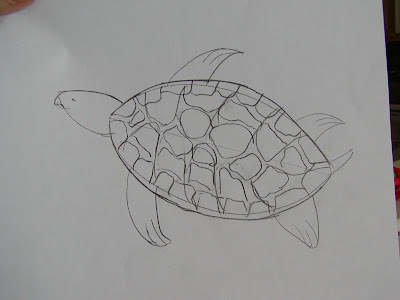 It was only after the ocean was created that I dreamed up that a turtle would look cute there, so I sat down with my pencil & paper and sketched Lucky. This will likely be a swap quilt. Ocean creatures are sort of personal. Some people like tropical fish, others like dolphins or sea horses. I don't particularly love any all that much, but I thought that the turtle might have wider appeal. He's going to be a purple turtle too...rather whimsical. 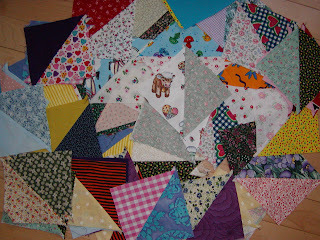 So now I need to design and make a mini-quilt for the Doll Quilt Swap, and there's only a month to do it in. I tend to work my best in the "near term", and am most inspired for fast paced projects. This is just my style. 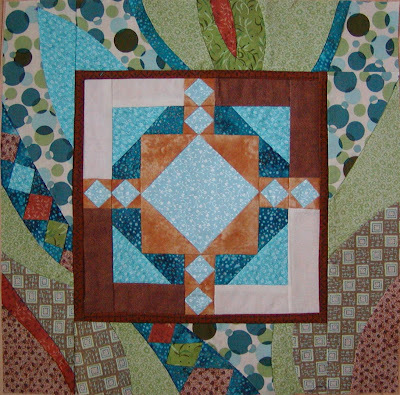 I came across this website of mini quilts today and I love them. They are awesome! I know I cannot make something quite like these, but I plan to adapt the concepts somewhat. 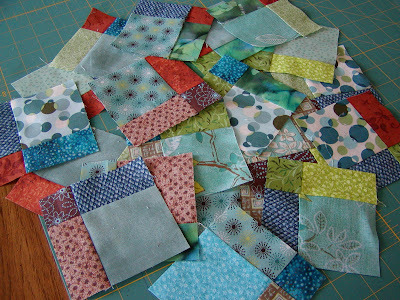 I have pulled out many of my blue scraps and I am assembling a quilt background that I hope to look like ocean. From there, I'm not entirely certain what will be on it. Possibly fish, possibly sea-greens...the details will be determined in the future. I know you are all loyal fans & participants of my 4-Seasons quilt swaps and the Spring Fling Round Robin, but I stumbled across this today. The Doll Quilt people have launched the 3rd session of this swap. It's faster paced, and there do appear to be a few open slots. BTW...I just found out that I am in !! I was #50 though, so the swap is closed. Hope I didn't get your hopes up too high. 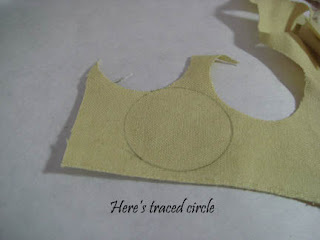 Now I am off to brainstorming what technique or pattern I want to try. This swap won't necessarily pair us up based on any preference so I just have to hope for the best. It's a different feeling being on the other side of the "swap-fense"! Ever since I saw this quilt, I have been mildly intrigued with the disappearing 9-patch pattern. Initially I couldn't see why someone would make a block, only to hack it into 4 pieces. But I decided I'd make a little project to kill three birds with one stone. Not 2 stones, three! First, this project is to keep me from hitting the bottle of red wine this afternoon. I'm not a winer (as opposed to a whiner, which I know plenty about), and I never drink without dinner consumption. But I have been having lots of problems with my almost 6-year old's behavior and today was an all time low. I work 3 mornings a week. He is home with our awesome nanny 2 of those days. She says that he practically waits until he sees me drive off before he starts his antics. We have spoken to him repeatedly, given reasonable timeouts, even made him write "I will listen to Jen" 20 times. It is just not getting through to him. He's enticing his three and a half year old brother to be a mis-behaven brat too. I got home today to a list of a dozen things they did from spitting to taking off their clothes to absolute rudeness. The prize was his room, which they refused to clean - ALL toys everywhere, books & clothes strewn about and about 7000 tiny plastic fuse beads on the floor. I nearly died. I promptly had my 3 year old help me clean all the toys into a big laundry basket and I have removed them from his room for several days. He can get the beads himself! The bedroom is now purgatory for him. Long story...I needed some sewing therapy! Second and third reasons for this project are shorter & simpler. I wanted to see this pattern in action & I wanted to try another project using what I think are very cool fabrics, but just not in my comfort zone of colors. This is me taking a leap of faith outside of my box, so to speak. So I made these 5-8" blocks, constructed of nine 3" squares. They are mostly in shades of aqua, turquoise and accents of brown and green. I'm not much of a blue person. And now that it is complete, I am not so sure about the orange either. OK, step two...hack the 5 blocks into 20 blocks. 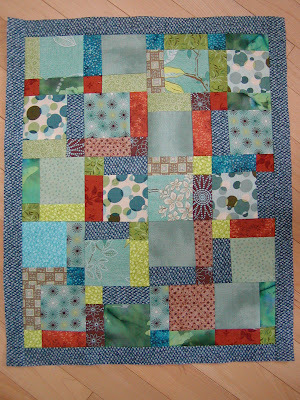 And lastly, voila...sew 20 blocks together and add a 3/4" border of the blue. 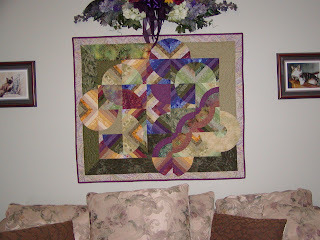 I plan to add a wide (maybe 4") ivory border around the entire piece. I will also use this as another vehicle to work on my free-motion/machine quilting. I started this last year, and dug it out a month ago to actually sew the appliques. I have played guitar as a child and as an adult, as has my husband. Unfortunately, I ditched it back in grade school for the flute, which I played regularly until a few years ago. We both have acoustic guitars. In fact, he bought me one for Christmas our first Christmas together (I was taking lessons then). I don't play often anymore, and even when I was taking lessons, I was nowhere as good as I was when I was 10. The mind of a child is so absorptive! Last year we bought our oldest (almost 6) a kid's acoustic guitar, as he was really into guitars then (making them from blocks, sticks, etc - anything). If he continues his love of guitars, this may be his one day. 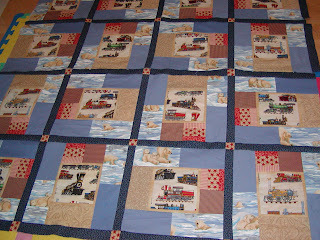 Here's the Strips-n-Curves quilt I made last winter, and finished quilting this past fall. I just love the way the colors move. Plus it coordinated with my living room so well, I hung it downstairs. BTW...we have 2 deep purple chairs in the room to pull out the plum shades of the quilt. I love the batik dots that I found in my stast to use in this project. 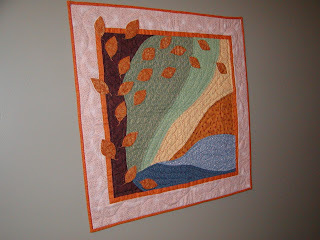 Here's the Fall quilt I gor from Luisa, although I mistakenly hung it upside down! That's part of our newly painted hallway. 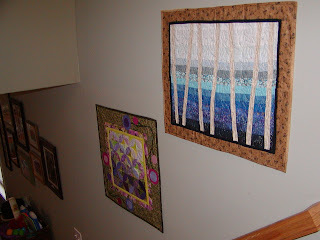 And the other hall wall shows the spring quilt I made and the Winter quilt I received from Maria. I have more of the upstairs awaiting the swap quilts from the Spring session of the 4-Seasons Quilt Swap and the Spring Fling Round Robin, and the others I have started and vowed to finish before I die! Here's a recent posting I made. It's good for a little Easter amusement...or perhaps a lot! Here's a little mini quilt I started last week. It will be about 20"x20" and is for a very special person (who will remain anonymous in case she is reading this). 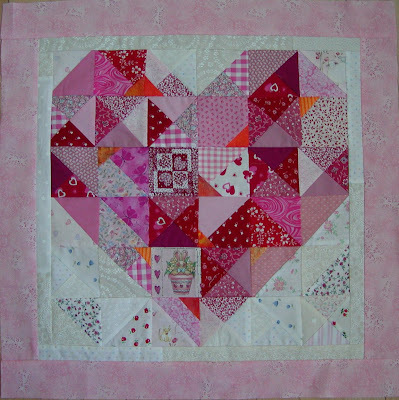 I found this pattern in my new quilt book - Quilt Pink. The border is a gorgeous Robert Kauffman, Fusions. The photograph does the fabric no justice whatsoever. 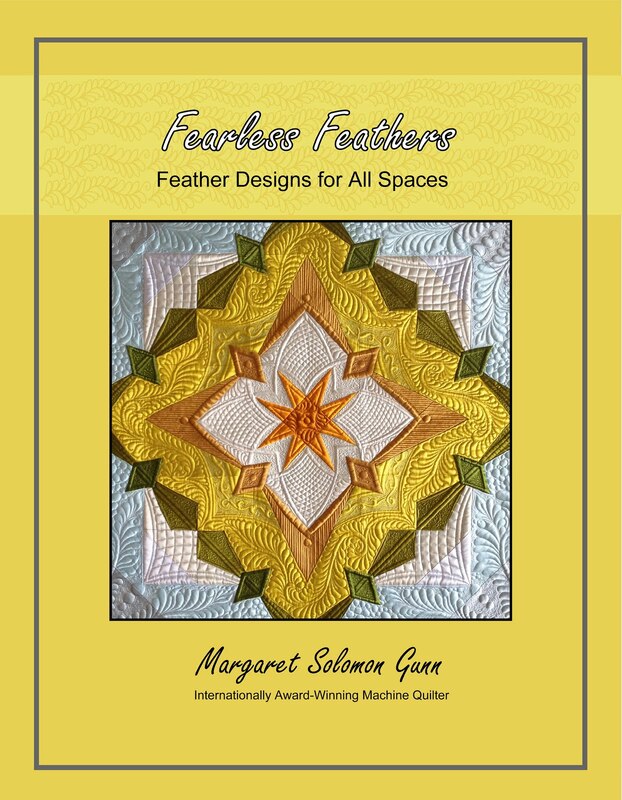 I plan to practice my machine quilting a bit more here. There's no joy in hand quilting with all these seams! So here are my yo-yo's. It took me 5 attempts to get three of them that are approximately the same size. They are not perfect, but I hope the recipient of this is not a yo-yo perfectioniste! They do complete the tea-leaf flowers nicely. 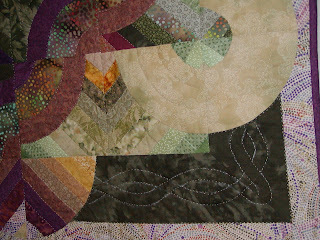 This may be the last sneak peek I post of my spring quilt until it is received by it's new owner. The mere thought of packaging this up for the mailman makes me sad. I absolutely love it, and know I will probably never make one just like it for myself. It is 95% done by hand. 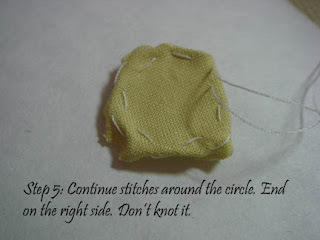 I only used my machine to sew the 16 tea-leaf blocks together and to stitch on the binding. 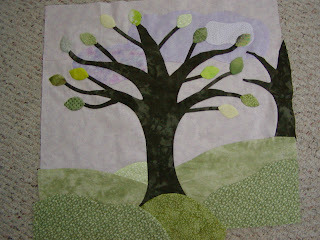 The leaves are and tree and top portion of the quilt are all hand appliqued. 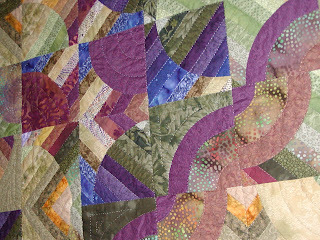 The quilting is all done by hand in shades of lavendar and green. I hope my partner loves it. Except for a label and a few small details, it is completed. I can't say the same for the other 3 projects I started last week! Yo-yo's make the most fun little 3-D centers for flowers. 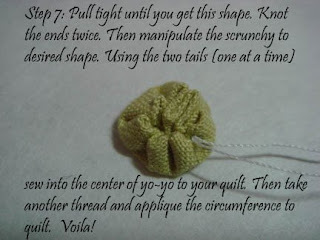 I am using these on my Spring quilt (picture coming soon). The fabulous Tami used them on her origami flowers. 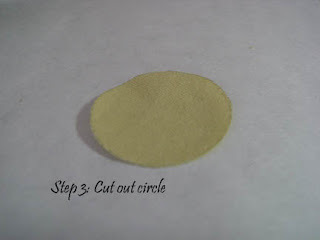 She has taken the time to send me this tutorial. It's got great instructions. It is definitely "Out There!" 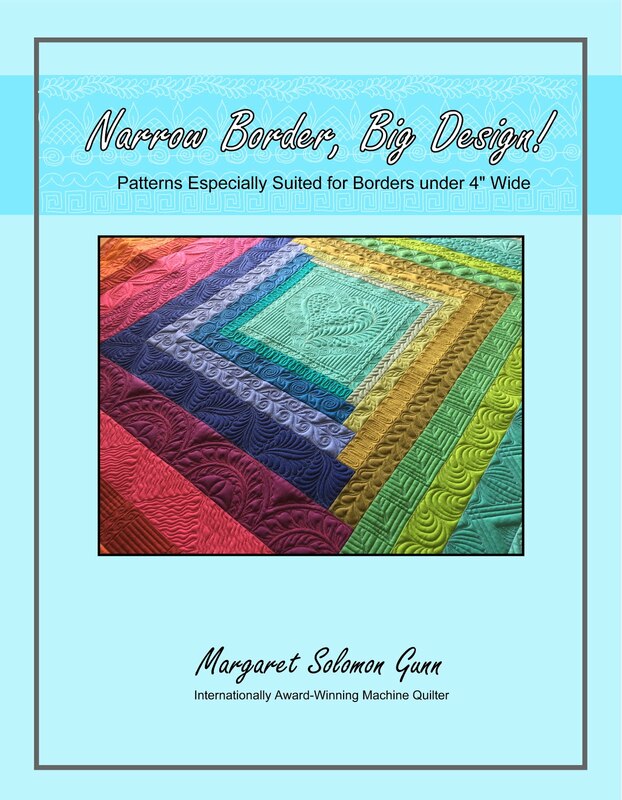 This border is bold and expressive, and I hope (fingers crossed) that the next recipient is able to do an effective 2nd border that the final recipient of the quilt will like. Should I put another narrow border around the entire block, or leave that for the next person? 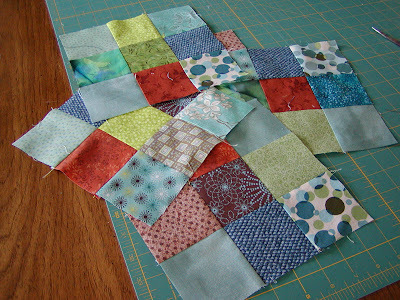 Any suggestions for what fabric to send with the block to the next quilter to use on the 2nd border?? BTW - I have loved and appreciated all of the comments that people have left as I started on this wild & whacky border, so now that I am finished, what do you think? I am torn. 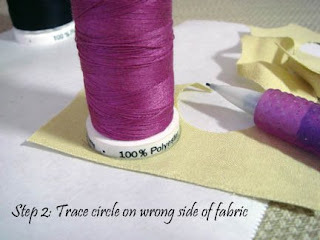 I have seen people's comments on what fabric they think I should forward to the next person. The orange is good. The deep green is good. My inclination is the brown with squares. Why? It carries forward a key design element and a color that is in the center of the block. The person doing the next border can always coordinate a shade of orange. I don't know; this inclination may change before I actually mail the block! 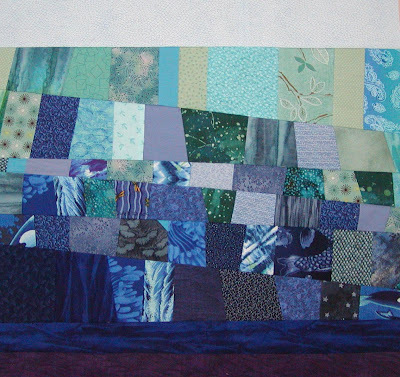 My block arrived yesterday from Carol, along with the deep turquoise fabric shown at the top left. The turquoise is nice and has a marbled effect with little speckes of gold. I immediately went through the pieces of fabric I'd bought on Sunday, locating those that coordinated best. I find that her block style is hard for me to design an effective border for. I want it to look good, but don't want to make a ton of those corner-stones on point in order for it to look cohesive. I have decided to stick with the design I sketched and showed last post. The colors are a tad different though - less blue & more green. Here are 2 sides of the block's border. Two more to go this weekend...(after I get through a busy school week). Thoughts??! ...and you won't hurt my feelings :-) Is it too bizzarre? too retro & funky? 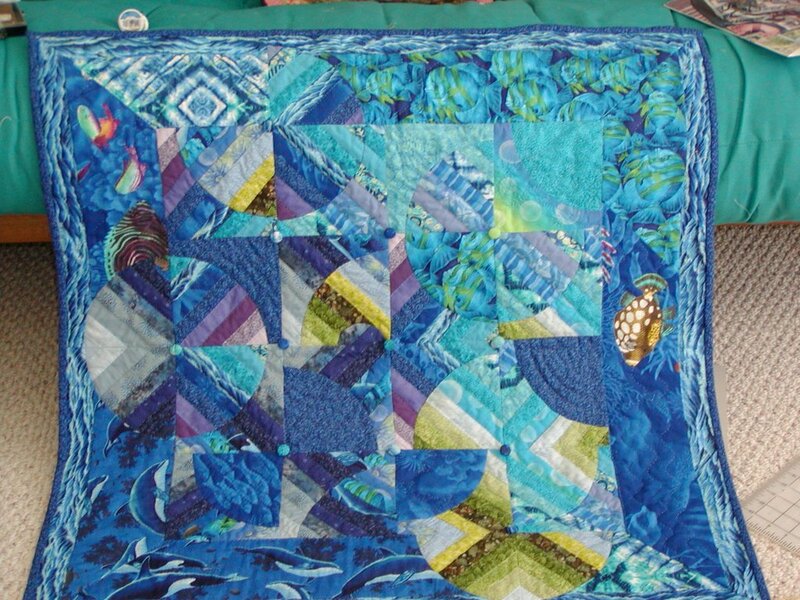 Would you croak if this quilt came in your mail?? 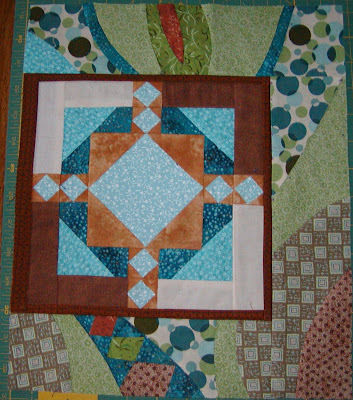 I saw on the Spring Fling Round Robin blog this morning that Carol has sent her 8" block. What is not known by anybody but me, the swap coordinator, is that this block is coming my way, hopefully tomorrow or Tuesday. This was exciting and scarry all at the same time. 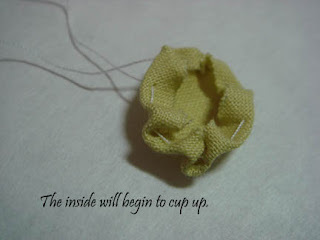 You see, this blog is very different from what I make in many ways. It is a heavily geometric pattern. Not that I shy away from the more geometric quilts, but this is even "edgier" (for a lack of better words) than what I do. It is also made of colors I usually avoid: Brown & Blue. I was so hoping to see red or purple or green; I have shelves of these colors and a great propensity towards them. But turquiose & brown??? I have only shards of scraps in these colors, and Lord only knows how old thay are. Oh boy, I have a job ahead of me! 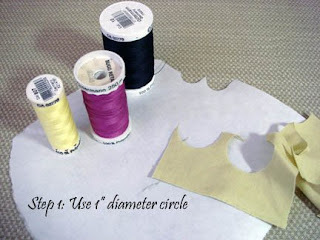 There's 16 small (4-6") pieces of different fabrics, totalling 2-1/2 yards. 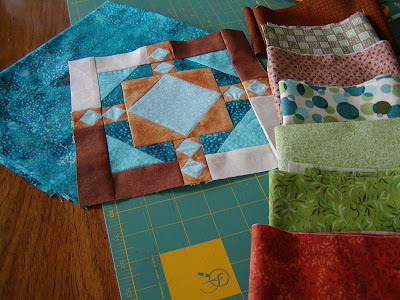 I am pretty sure that the turquoise on the bottom left stack is the one Carol used in her block. What I do not know is what fabric she is forwarding to me. 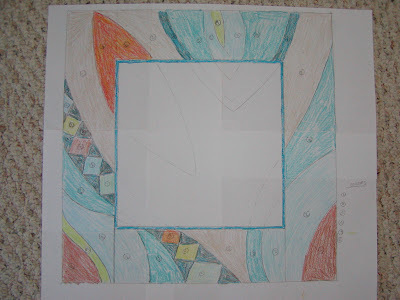 After looking at the block Carol is sending, I sat down to design an unconventional 2.5" border. My goals were: broaden the depth of the colors (more tones within the given tones that she used), soften the colors (I find the stark difference in the turquoise & brown to be harsh), and soften the design while utilizing & coordinating my style with that of the block. Here is what I drew up...keep in mind that the colors I colored on the sketch are totally up in the air still too. It is remainiscent of Georgia O'Keefe. 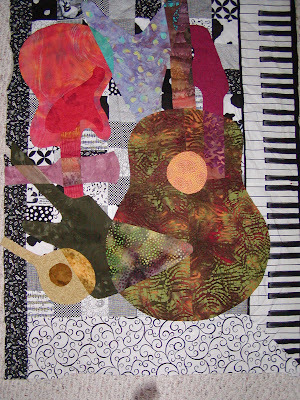 I wish I could quilt this one; I have shuch great ideas. ...and she is more like taking rags to riches. This reminds me of something our grandmothers might have made from decades of worn out, outgrown clothes. 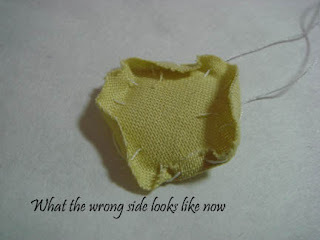 It's not lovely, but there is officially less ugly in my sewing stash, and that alone makes this a good thing. 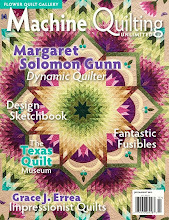 Plus it gives me something to practice my machine quilting on. 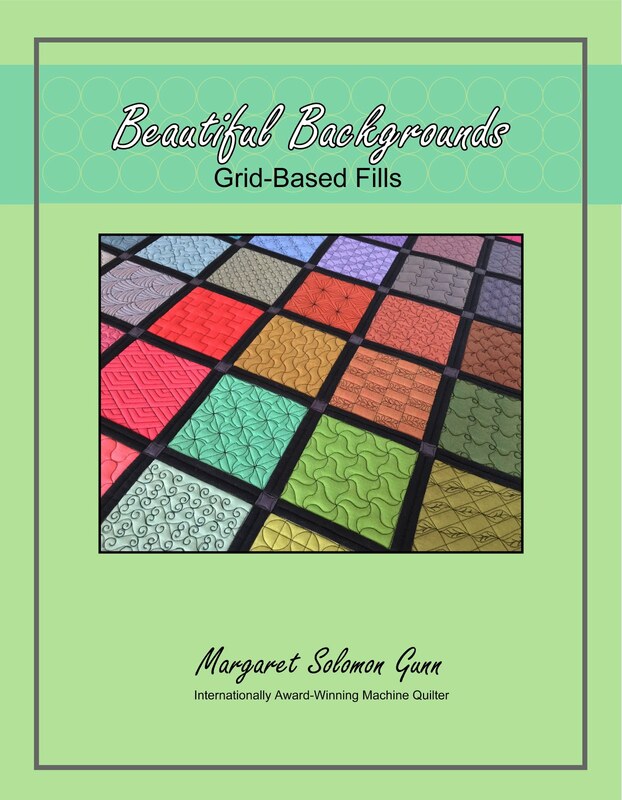 I have found that the busier patterns are more forgiving to my bad quilting! Here's the finished flimsy at 40"x48". I can't say I am over-the-top thrilled with it, but that's life. Next time I think I would stay in a couple of color families rather than the entire rainbow, and keep the lights lighter, and darks darker. Or perhaps this ought to read : "The Bad, the Ugly and the Uglier"
Lisa has shown us that we can basically take rags & make riches. 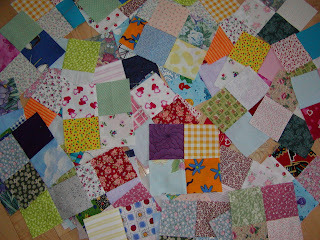 Take your ugly leftover scraps in any and every color and piece them together into the most lovely scrap quilt. 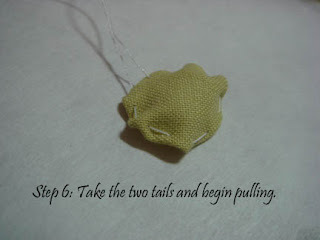 This is the Jacob's Ladder pattern, which is very simple and works well for those pesky leftovers. 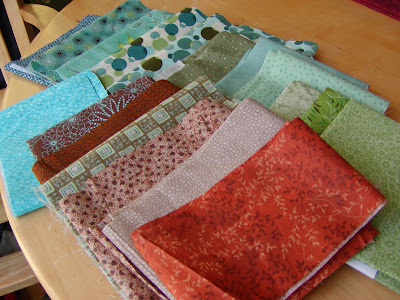 I, like so many other quilters, have TONS of scraps. 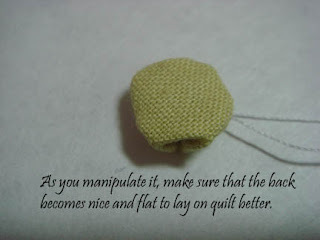 Many were given to me from other quilters so you know that they are the least wanted pieces of ugly material around. I have taken the challenge to see if I can create something equally as pretty. OK, I'll just settle for nice & usable. This will likely be a Project Linus giveaway this year. 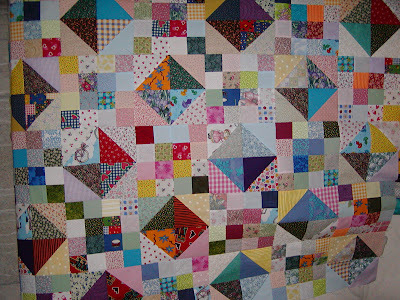 Lisa's is (in her defense) done in mostly shades of pink, blue & green, whereas my quilt uses all colors. - Piece parts A & B into 4-patch squares. There will be 30 of these. dontcha just love my assortment of UGLY fabrics?? I have everything from apples to batiks to stripes and dots and checks, to hearts, flowers, ocean squid and my personal favorite, the cow! Hopefully this quilt will in fact weed out some of my uglier scraps. 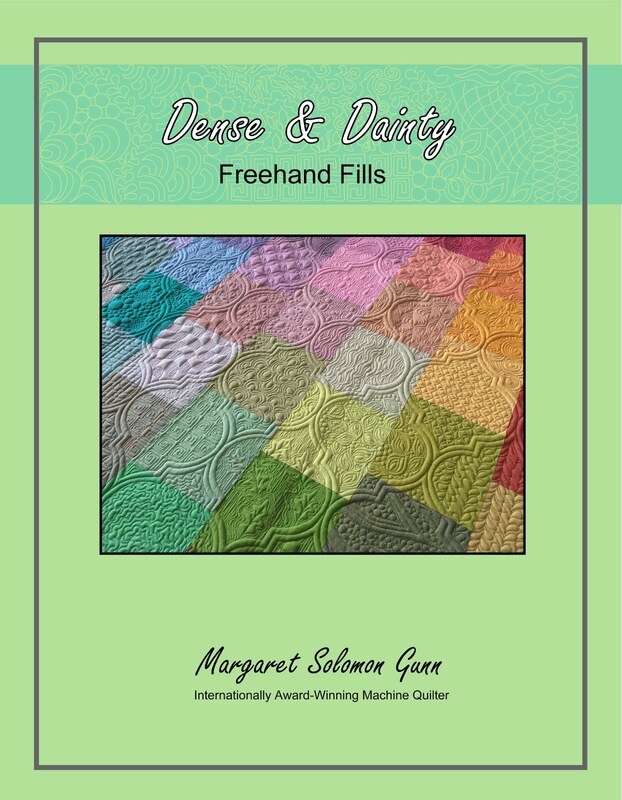 I am usually not a big purchaser of quilt books. 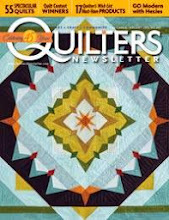 I like to think that I will get inspiration for quilts on my own. I occasionally have watched quilting shows, and take notes on the patterns I like. I also surf the internet, looking for patterns and designs I like. 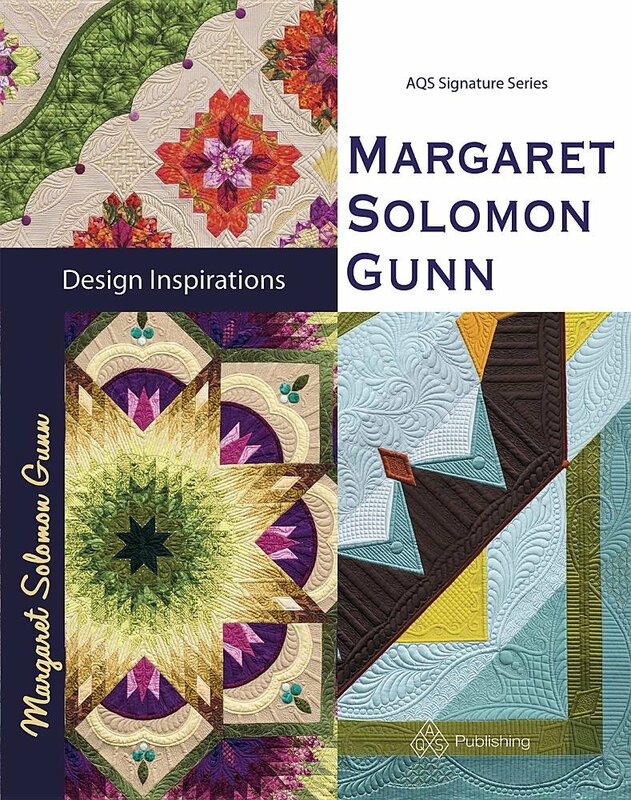 I have a couple of books I love to read and re-read (quilt books made after the Quiltmaker's Gift children's books). These are devine! Today I ordered a new one that I hope I like. That picture is a touch washed out by the flash. But what says "spring" better than a few hyacinths and a nest of robin's eggs? 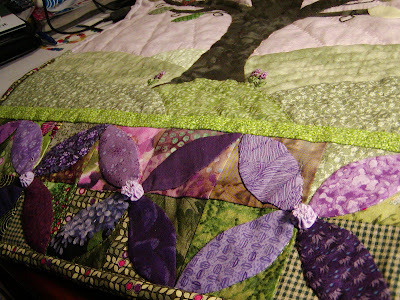 Oh, and you got a sneak-peek at the cute swirls embroidered on the tree's branches...oops! 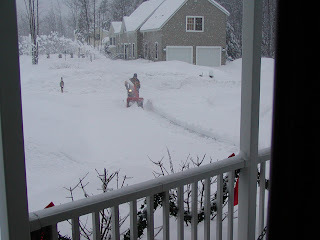 Yea...It's Saturday & I don't have to juggle working, mommy, 3 kids AND snowblowing 10" of snow. I don't care if he is sick; this is MAN's work! ...and the neighborhood had plenty of working men yesterday. Despite how it looked outside, in between an unusually heavy working period with my 2 classes (Statics & Dynamics- do I hear an "Ew..."? 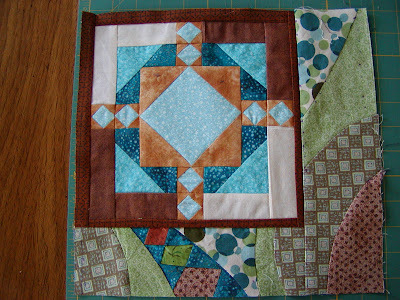 ), I have been making headway on my 4-Seasons Quilt Swap mini quilt. It's actually further along than this; I'm building the suspense. So is the burning question in your minds, "Where's she gonna use those tea leaf blocks?"... wait and see (grin).